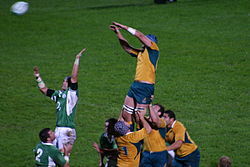 A line-out during Ireland against Australia in 2006. Tha Sgioba nàiseanta rugbaidh Astràilia fear den sgiobaichean mora aig rugbaidh, Bha iad sa h-uile Cupa an t-Saoghail, agus tha iad a' cluich a-measg na Tri Naiseanan. Se fear den sgiobaichean nas fhearr san t-saoghail a tha anns na Astrailianich. Bhuain iad am Cupa an t-Saoghail ann an 1991 & 1999. Tha iad a' cluich sna leintean or is uaine. Cleachdar wallaby mar logo aca, agus sin far an d'thainig am farainm aca. Air a tharraing à "https://gd.wikipedia.org/w/index.php?title=Sgioba_nàiseanta_rugbaidh_Astràilia&oldid=497187"
Chaidh an duilleag seo a dheasachadh 24 dhen Ghiblean 2015 aig 13:27 turas mu dheireadh.